New Vogue Pink Bi-Color Rose is white, slowly transitioning to pink on the tips. 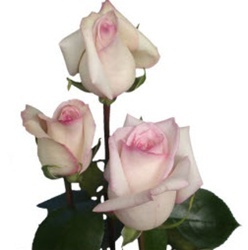 New Vogue Pink Bi-Color Rose fresh wholesale roses have nice heads which open into a classic-shaped bloom with curling edges. They are a favorite for wedding bouquets, floral arrangements and lavish centerpieces. Free shipping!